The European Rugby Champions Cup is a major European rugby competition involving the leading clubs from England, Scotland, Ireland, Wales, France and Italy. 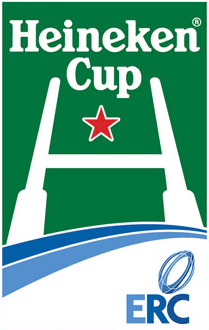 It began in the 1995–96 season as the Heineken Cup, with sponsorship from major brewery Heineken, and kept that name through the 2013–14 season. Disagreements between the leagues that sent teams to the competition led to the end of the Heineken Cup, with the Champions Cup taking its place starting in 2014–15. Toulouse have won the competition a record four times, Leinster and Toulon three times, while Munster, Leicester Tigers and Wasps have won it twice each. Toulon are the only team to have won three times in a row, winning the last two Heineken Cups in 2013 and 2014 and the first Champions Cup in 2015. The current champions are Saracens. European Rugby Champions Cup Facts for Kids. Kiddle Encyclopedia.